the New Scientist article where the investigators asked if this amount of dark matter is constant throughout the history of the cosmos. When they looked at very old galaxies, from about 10 billion years ago, they found that there was no need to use any dark matter to explain the orbital velocities observed in their measurements. Wow, so this might mean, if their analysis is verified, that there was not any or not as much dark matter present at that age of the universe. We will have to wait and see. I am also going to look up the original paper as published in Nature to get some more of the details. Well the weather has just been very cloudy and did not clear up in time for our scheduled Blackstar Canyon observing party. About a dozen OCA hopefuls showed up at the gate, just on the slim chance that the clouds would depart, only to leave disappointed after a couple of hours of parking lot conversation. At least we had a chance to meet new OCA Blackstar volunteer coordinator, Steve, and to dream about being able to observe after these four months of bad weather cancellations. I was especially interested to meet a Irvine Valley College student describe how she was studying astrophysics. What? An actual student studying astrophysics.How could this be, given my ongoing study as just a "physicist wannabe", how did I miss out on this? Anyway, it was neat to meet her and hear about all the work and math she is doing as part of her astrophysics study. I'm not sure I could do an actual course anymore (just look at how I gave up on my Python course) so keep up the good work, Erica(?)! 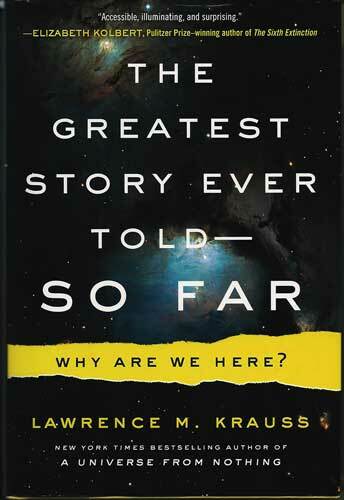 Ok, we couldn't observe the stars, but the next day we could attend a book signing event with one of the theoretical physics stars, Lawrence Krauss, who just released his new book, "The Greatest Story Ever Told -- So Far." 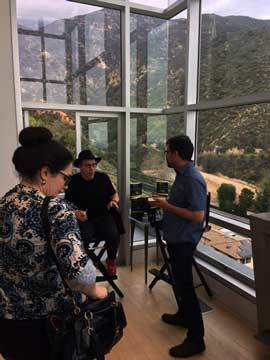 The book signing event, sponsored by the Skeptics Society, was held at Mad about Music, David's, modern home high in the hills above Altadena, where about 50 folks showed up for the interview and book signing. It was quite a soiree, with wine and hors d'oeuvres and fun interaction. Krauss is well known in the science and general community, especially in dark energy research and has authored other books of great interest too. He is outspoken and has offered critiques of string theory, politics, philosophy and religion. His latest book tells the story of the history of modern physics and how symmetry and gauge theory led investigators to find the hidden aspect of nature. Great, this book will help me especially as I try to delve more into gauge theory, as described in the March 17, 2017 post that described another great book, "Deep Down Things", which also deals with the hidden symmetries. Maybe gauge theory will finally start to make some sense to me. I knew that he was a critic of string theory, so I asked him a question saying that I noticed that "string theory" was not listed in the book index, and before I could get out the rest of my question, he filled in the gaps and was surprised that it wasn't in the index, but that he included much discussion about it. Only later during the book signing period did I have a chance to finish my question, which was, "Is science getting to the point where new theories might languish for years, like string theory now going on 40 years old without corroboration, because getting the observational data to corroborate the idea does not come for many years. Yes, he said, it might turn out to be that way on many questions, but keep in mind how only recently with the discovery of gravitational waves, things can change very quickly. After all he said, it has taken society thousands of years to finally be able to ask and potentially answer many questions that science asks today. So, all in all, it was a very good event. Speaking about getting data to corroborate our ideas, I just by chance found this quote by Ed Deming on my LinkedIn website. I first discovered Deming while doing a MBA student project, where we reviewed how he greatly impacted the incorporation of data and quality control into building business practices and processes to use ongoing data to maintain and improve quality manufacturing. But as physicist wannabes and really folks in general, we have to continue with his admonitions, true then as now, and strive for data and rationality to back up our assumptions and theories. Finally, I want to show a little bit more of the analysis I have been doing to see what went wrong with my recent observation of the solar spectrum, just using natural sunlight that comes in normally through my office window. Remember from my previous posts, especially from March 23, 2017, where I displayed the first attempted spectra with the new LISA spectrograph, and found that the ISIS software, probably due to operator error, did not display the expected spectrum for sunlight. So, I wanted to see if the spectrograph was not working correctly or if the way I initialized the ISIS software was not right, so I just imported the data file into my other, old trusty software tool, AIP4WIN, and took a look at the spectrogram. 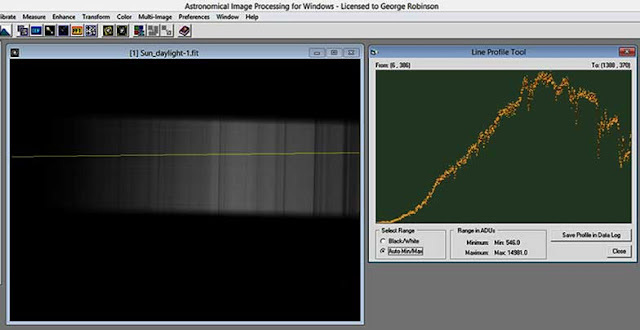 The screenshot below shows the original spectra data on the left and then using the "Line Profile Tool" the magnitude of the profile data is shown on the right side. 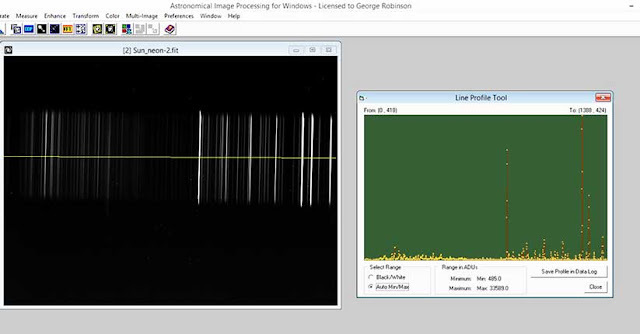 Wow, not that is what I expected to see for the solar spectra, so it seems the spectrograph is working just fine. Now AIP4WIN cannot assign wavelengths to the x-axis, so we don't know what wavelengths are associated with the peaks and absorptions evident in the curve, but at least the spectrograph seems to be working. Now the ISIS software needs a calibration spectra in order to assign wavelengths to the data and a neon lamp in the spectrograph is used to provide the calibration data. The screenshot below shows the spectral data for the neon lamp. Again the same line profile tool is used to display the intensity of each of the lines across the whole x-axis, which is displayed on the right hand side. Now, the user was supposed to identify a particular series of five lines in that spectra and use that to calibrate the spectrograph. But, I couldn't find the right five lines and just picked some line and as a result it seems that might be why ISIS didn't report the correct wavelengths. Whoa, maybe I see why I couldn't find the five lines? Notice how even though each individual line seems quite bright, the profile intensity shows that really only 2 or 3 of those lines are really bright. The other lines, even though they show up on the spectrogram, do not have much signal intensity. This maybe is the reason I couldn't see the right pattern of lines. Maybe I just need to have a longer exposure of the neon calibration lamp so that more than just the 3-4 lines show up with more brightness. 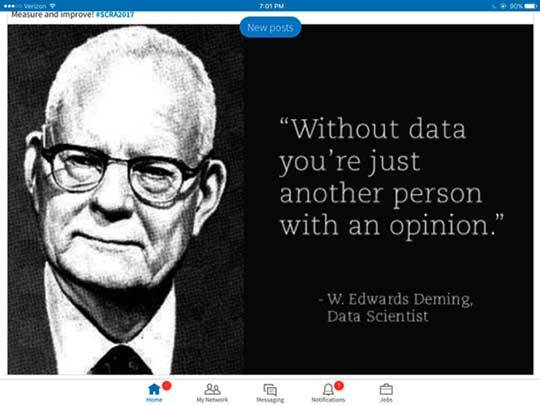 Remember the Deming quote about the need for data to support your analysis. We will pursue this course of action next time. Well, that is about it for this week. My next outing is at the Distinctive Voices lecture at the Beckman Center where we will hear about Synthetic Biology and Malaria. Come and meet if you dare get closer to understanding the risks and benefits of this new technology.